Back in April I reviewed the magazine Abyss and Apex, and in there was a story by Walter Dinjos. There he mixed two worlds that have nothing to do with each other and brought them together. I have always liked myths, magic and religion. So today I have a guest post by him. That's how superstitious some Nigerians can get. Or maybe there’s truly magic in that multicultural West African country. I earnestly can’t confirm anything. If you are curious about magic in Nigeria, all I’ve got for you is hearsays and tales of blind faith. The idea of magic in Nigeria makes me think of the food chain. Call it the magic chain if you will. The gods are at the top of it. Us ordinary folk are at the bottom. Everyone else in-between is a magic-wielding villain. I will tell you about these deities and villains. These are the many gods various communities in Nigeria worshipped prior to colonialism in the region. Among the Igbo tribe in southeastern Nigeria, you will hear of deities like Amadioha, Ozodimgba (this one appeared in my story, The Woodcutters’ Deity), Ikoro, and more. In some places, they are the spirits of dead ancestors. In other places, they are simply gods and are represented with great trees, carved stones, or ancient sculptures. These deities are believed to own and bestow magic. These are like the custodians of magic in the land of the living. They serve as a bridge between deities and other humans. When they serve a particular community, they are usually called chief priests, ezemmuo (king of all things spiritual), or ezenwanyi (a woman with immense power perhaps like an ezemmuo), And trust me. They exist. Whether they can truly perform magical feats (like heal, curse, protect with magic on behalf of each community’s deity) is another story. Well, in my story, Middle of Nowhere, magic actually works. You see the savage jujuist place a curse on the protagonist. When these witch doctors merchandise their magic instead of serving a community, they are often called native doctors or dibia (a spiritual healer). They basically serve their deity’s interests. And they rarely use their magic unless when absolutely necessary, as they understand it isn’t something to be toyed with. However, if you want it, they will gladly give it along with the price of obtaining it (hideous sacrifices) and wielding it (difficult rules and repercussions). These Witch Doctors. How Are They Made? Some are osu (outcasts)--people dedicated to a deity when they were little. Some inherit the role from their parents. Sometimes grownups ask their deities for a child. In return, they promise the child will serve the deity. Some witch doctors are born dada (that is, with a type of hair that is naturally and untidily matted), and here people believe that children with dada hair are of spiritual origin. I’m dada, but here I am, not serving any deity. In case you are wondering, that’s me in an old picture. In Nigeria, these are not your ordinary witch doctor. There’s a difference. Of course, they are believed to have powers--usually obtained through initiation, but they serve only their own interests. They thrive by siphoning the life force or imminent success of their prey. People here believe they visit at night, disguised as owls, cats, or wall geckos. And they attack by marking their prey’s body with their claws and from the slit do the siphoning. People who believe they are victims often complain about having bad dreams and the feeling of a pinioning weight swooping on them as they sleep and never letting go. I just finished writing a story about these beings--How to Nab a Witch. These people, like the witches and wizards, serve their own interests. They want wealth, power, healing, protection…, and they procure these things through magic, of course, at a price. They don’t wield magic in a direct sense. They visit a witch doctor, carry out the necessary ritual, which can include sacrificing a goat, fowl, or even a human. Then the witch doctor infuses an object like a ring, bracelet, broom, food, or drink with the particular magic power they need and hand it to them. Of course, with rules of usage like “don’t sleep with a woman,” “never allow water to touch the charm,” “always have the charm on you,” and so on. Breaking such rules could lead to the charm not working. It could also lead to madness or even death. Well, so I heard. If you should go to a Nigerian native doctor and obtain a do-as-I-say charm, you would most likely be given a ring. It’s believed that should you shake your prey’s hand while wearing the ring, they would become extremely gullible around you. A do-as-I-say charm can also be something you eat, drink, or touch to your tongue before speaking to your prey. 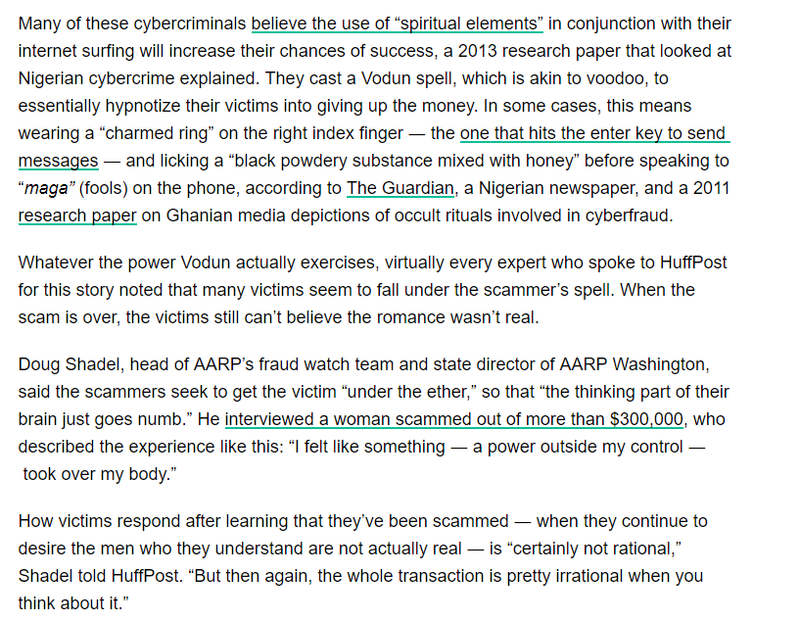 In fact, it’s often said that Nigerian scammers use do-as-I-say charms to make their victims guilliable. I don’t know what to believe, but here is a screenshot of an article about the subject at the Huffington Post. It’s horrible. The idea of magic is exciting, but in the case of do-as-I-say charms, I can't help but hope they are just fictional. You could also visit a Nigerian native doctor and ask for protection from armed robbers. After performing the necessary ritual, the witch doctor would likely give you a broom to hang on your gate. The broom could serve as a warning to robbers that recognise the charm. But for those that don’t, breaking into your home would leave them hypnotised. And they would grab the broom and sweep your compound until you find them and release them from the charm. This is another type of protection charm. It basically makes you invulnerable to bullets and blades. So people here believe. The ritual involved can be very dangerous. I heard people get buried alive simply to obtain this charm. Plus, there are rules. The usual includes: “Don’t eat food prepared by a woman in her period” and “Don’t sleep with a woman.” I don’t know about you, but I’m beginning to think that magic in Nigeria has something against women. Anyway, coming back to rules, it’s believed that the Bakassi Boys, a vigilante group that operated in Abia, Anambra, and Imo States in Nigeria, used this charm. Eventually they started breaking rules. Also they became entangled with women’s issues and politics, and that led to their fall. The magic behind this is hideous, whether true or not, and usually involves sacrificing a human being. I won’t go deep into this as what I’ve heard is very disturbing. If it’s any consolation, it’s often said that people that obtain blood money always end up miserable, in spite of their wealth, and their deaths are untimely and very unpleasant. 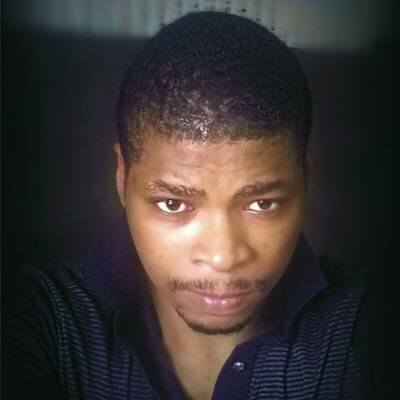 A man named Clifford Orji was suspected of both cannibalism and merchandising human body parts to blood money seekers. Here in Nigeria, you can settle a dispute before a witch doctor and their fetish god. Typically, you honor the god with sacrifices and ask it to investigate the dispute and curse the guilty party. Here is the story of how Eze-ego (a wealthy nigerian whom many suspected of having blood money) died after someone reported him to a deity. Does Magic Truly Exist in Nigeria? I was sitting by a cement shop one day and two young men approached me, asking if I sold sound systems. I looked behind me and frowned. Then I said no. They asked where they could buy one and as I gave them directions, one propped himself against the iron beam where I placed my left foot. He then began to move his ringed finger towards the foot. He touched me, and I felt something. I don’t know what it was. Maybe a tingle or electricity passing through my body. But then last I checked, I didn’t like it when people in general, much less strangers, touched me. Yes, so maybe I was just nervous. Onlookers started asking why they were running. I explained everything to them. And they said I was lucky. That the boys had a do-as-I-say charm and would probably have made me empty my bank account into theirs if I had allowed them to continue touching me. Those young men. Their charm didn’t affect me. Well that’s all good. It feels great to be special, believe me. Sorry Debbie! I deleted your comment by mistake :( i miss the days when blogger sent me all comments cos then I could have posted it. But thanks for stopping by! This was interesting. Thank you for posting! That was really interesting to read about. Thanks a lot @Blodeuedd for having me. This is a fascinating post, I love stories and legends of magic from real life cultures! Interesting post! I learned quite a bit about magic and Nigeria.